My starter, which I named Billow, was born 10 years ago on New Year's Day when it exploded into life right through the plastic wrap which covered its container. 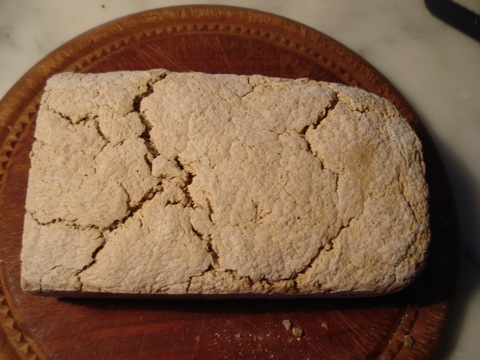 I have made sour dough bread with it as the only yeast, and also used some of the old excess starter saved from feeding it as a 'dough improver'. I have kept Billow alive all this time by feeding it once a week and refrigerating it between feedings. A starter is meant to be shared as well as used so I gave a piece to Woody who continued the tradition of feeding it once a week but never used it to bake bread. Finally, after much teasing, he chose this month to take the leap. And here is his story beginning with a Haiku:two years just starters, beer bread born, timidity~~ past Back in August of 2008, I travelled to New York to assist Rose with the arduous, weeklong task of copy editing Rose's Heavenly Cakes. 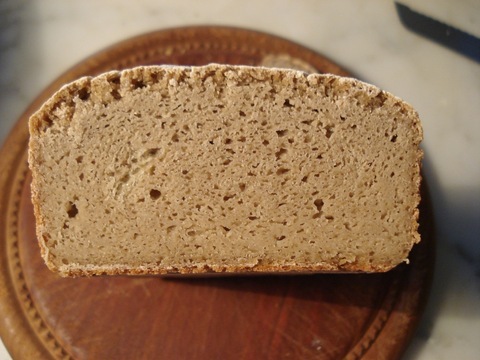 Along with some baking supplies, Rose entrusted me with a portion of her sour dough starter, the idea was that with our book virtually done, I finally should bake some bread. Up to now, my baking forte has been cakes, writing about cakes, an occasional pie, more cakes, and assisting with some blog replies on cakes. I have never even baked a chocolate chip cookie. To help assure that Billow's offspring would survive in the hands of a beginner, Rose instructed me to feed Rosewood once a week and freeze the excess starter. As a further precaution, I divided Rosewood into two starters. Within weeks, I had an ample supply of frozen starter discs. Over the past couple of years, Marie Wolf, a true bread baker at heart, has even graciously been nurse maid to my starters on occasions when I have travelled with Rose. Each time, when I have returned to pick up the kids, she has asked when I will finally make a loaf, especially considering the fact that I have watched Rose make bread on a couple of occasions. I kept rationalizing that bread making was alchemy that would not turn out for me. Finally, Rose gave me an excuse for making a loaf of bread, with a somewhat free weekend, a need to feed my starters, and her suggestion to make the beer bread recipe which has old starter as an ingredient. I frankly spent more time reading the recipe's instructions and cross-referencing The Bread Bible than it took my physical effort to make the bread. 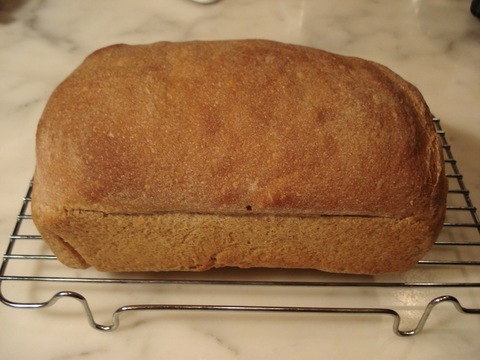 In less than 15 minutes of my involvement of easy mixing, shaping, cooling and unmolding, with letting the yeast do the hard work, within a few hours I had a wonderful loaf of bread. Then I sliced it still warm for a delicious sandwich. Timidity~~past, as in my last line of my Haiku. A brioche has just been baked to be cubed for the Caramelized Pineapple Pudding Cakes; and now no need to go to the store for bread. So to all who also have rationalized not making bread, please do try it. Skip the two plus years of bread starter feeding resulting in hundreds of discs taking up lots of freezer space and crying out to be dignified into bread.